The Cathedral of Saint Apostles Peter and Paul is the temple belonging to Belarusian Exarchate of the Russian Orthodox Church. The full name of the church - "The Cathedral for the sake of Saint Apostles Peter and Paul's First-Ranked." There’re some other names of the temple: "Petropalovsky Cathedral" and "Catherine's church." The Cathedral was founded in 1612. It was built according to the architectural style baroque. It is located in Minsk, Rakovskaya street, 4. The Cathedral of Saint Peter and Paul is the oldest church of Minsk. This temple, created by the voluntary contributions of the inhabitants of the city, was founded in 1612. At first the church was belonged to the Peter and Paul’s monastery. 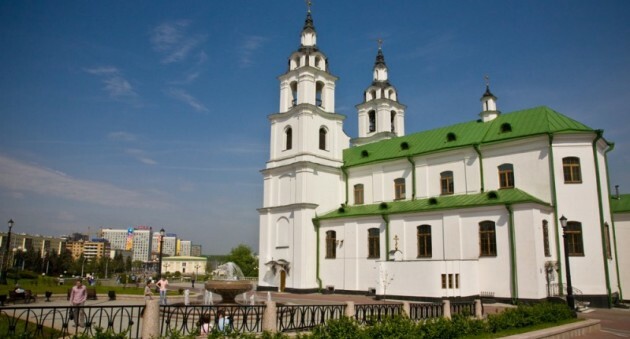 For almost two hundred years it was a sole custodian of the Orthodox Church in Minsk. In the second half of the XVIII century the cathedral was in distress. The temple was rebuilt by the Empress Catherine II donated funds, and subsequently reconsecrated in honor of great martyr Catherine. Then St. Catherine's church obtained the status of cathedral. During the French occupation in 1812, the temple housed the enemy infirmary. The church property and utensils have been looted or destroyed. The huge damage was caused to the temple. In 1870-1871 there was a cathedral updating. Above the temple was erected a large dome, the iconostasis were redesigned and the walls painted. In 1913, according to the cathedral documents there were 5698 members. In 1933 the church was closed and its facilities were arranged with a warehouse. In December 1941, the church was reconsecrated again and became known as the St. Peter and Paul’s Cathedral. Public liturgies were resumed, and continued until the Great Patriotic war. From December 1944 the cathedral was rebuilt into the State Archives. In December 7, 1991 the service at St. Peter and Paul Cathedral was resumed again. From 1997 the church again restored its interior. Currently the cathedral’s restored, removing later additions, tower attached to the tent over. As an architectural monument of national importance, the cathedral was included in the list of historical and cultural heritage of the Republic of Belarus.